In early 1982, I went to a packed-out evening meeting in a parish hall in St. George’s, Grenada where I was living and teaching. 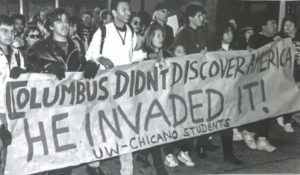 The main speaker was the militant campaigner of the American Indian Movement (AIM), Russell Means, who was touring the island villages, speaking at revolutionary parish council assemblies about the new US-wide resurgence of indigenous American resistance. I could tell that there was a strong, immediate and instinctive connection and empathy between the speaker and his Caribbean listeners as if it had risen out of history, and it is only now, nearly four decades on, that I realise its roots, prompted by a short and often revelatory pamphlet. For in their powerful account of the ‘land grabbing, massacres and slavery’ provoked by the landing of the vessel the Mayflower on the Atlantic shoreline of what was to become ‘Plymouth, Massachusetts’ in 1620, historians and veteran campaigners Danny Reilly and Steve Cushion tell how rebellious indigenous Americans – some of those who survived the mass slaughter by the new colonists – were dispatched to the Caribbean in direct slave exchange for Africans transported to the islands to work on the newly-developed sugar plantations. Russell Means may well have been speaking to people of his own lineage that evening in that dimly-lit Grenadian hall. I thank Reilly and Cushion for this historical insight which I learned from their deeply educative pamphlet, ‘Telling the Mayflower Story’, written and published to give an alternative perspective on the host of commemorative celebrations and ‘sanitised’ interpretations of the Mayflower narrative, particularly in Reilly’s home port city of Plymouth, Devonshire, England, from where the Mayflower set off. For the four hundredth anniversary of its voyage and eventual disastrous landfall marks the beginning of a centuries-long process of rampant land seizure and theft, successive wars of conquest, genocide and colonisation and the continuous mass murder of generations, the creation of apartheid reservation deformities and the miseducation of thousands of children in Christian mission schools, designed to rob them of their culture, language and inheritance. Yet in 1870, it was the future vice-president of the United States of America, Henry Wilson, who proclaimed on the occasion of the 250th. 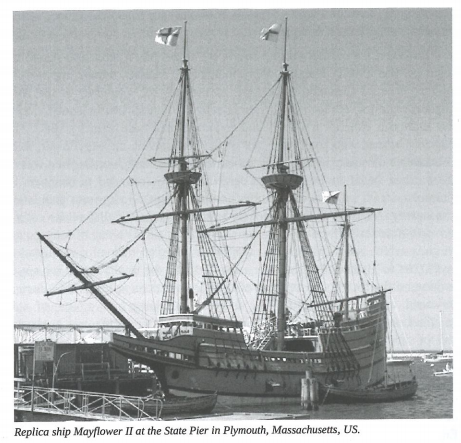 anniversary of the Mayflower‘s arrival and the establishing of the new ‘Plymouth’, that ‘the foundations of civil liberty in America’ were to be found ‘in the cabin of the Mayflower’. Another story is potently told in Reilly and Cushion’s pamphlet. The authors have condensed the testimonies of epochs of colonial incursion and anti-colonial struggle into their brief but supercharged account, while also vividly illustrating the way in which the commerce of US imperialism worked in its fundamental stages. 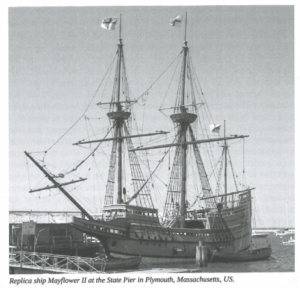 The Mayflower voyage itself was financed by London’s Merchant Adventurers, and the Crown-licensed Virginia Company which offered ‘patents’ for colonial settlement enterprises. While the colonists began to prosper and were pleased to accept ‘bounties’ for the scalps of the ‘hostile Indians’ whom they killed, by the mid-seventeenth century all along the New England coast, ships were being built for the slave trade. Some five million gallons of rum, distilled in Rhode Island and Massachusetts, were exchanged for slaves on the Guinea Coast, while capital investment by the New England banks became an integral part of the development of slave-based plantation cotton in the southern states. All this, prompted by the less-than-heroic trans-Atlantic voyage of the Mayflower. This is not a publication to rest on library shelves. It is genuinely popular scholarship, to be passed around and read everywhere; for if the historians’ mission is to reveal the truth and dispel lies and illusion fostered by the past, its authors achieve this with fact and lucidity. To buy a copy by cheque or PayPal, email: s.cushion23@gmail.com. £4 including p & p (£5 outside UK).